Previously during my trip: I'm on a flight between New York City and Johannesburg for a really, really, really long time. Upon entering the airport, practically every wall and floor is covered with World Cup sponsors and branding. It’s quite amazing to see, and it’s the first impression that the World Cup Organizing Committee is going after, I think. Customs is very straightforward. I show my FIFA accreditation letter and my passport, and I’m on my way to collect my bags. One interesting thing about passing customs is that some type of infrared machine must first scan you. Called “FevIR,” it apparently detects if you have a fever so they can quarantine you in case you have some sort of disease (swine flu, SARS, yellow fever, whatever). I take my bag and see Dean at the baggage carousel, who gives both his mobile number and his daughter’s home phone number to me in case of any emergency. 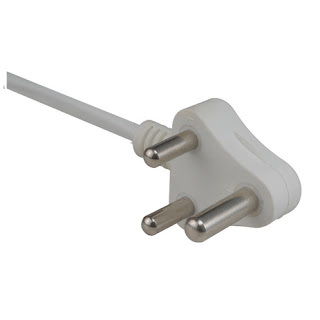 I doubt that Americans would do the same for some random foreigner, so +1 for South Africans. I step through another set of doors and find myself in a pseudo-lobby between the outside world and the secured airport world. There are a few currency exchange places, and I convert my remaining American currency into South African Rand ($1 U.S. is roughly equivalent to 7.50R). I get slightly screwed on the conversion to Rand, but I'm thankful that I had already exchanged $250 worth of currency before leaving (which makes me feel super-rich, as that's the equivalent of about 1,700R). I walk through another set of doors and find myself in a giant atrium, with tons of people lined up against a metal railing, most of them drivers, with various names scrawled on various boards, papers, and pieces of cardboard. 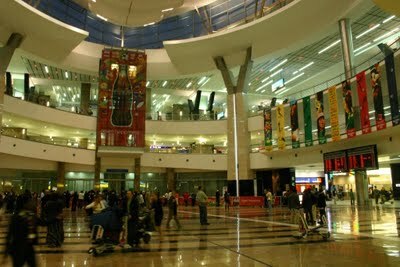 I wander around the massive arrivals hall, where they have tons of shops and food places. My first stop is at the MTN store, where I purchase a pay-as-you-go cell phone for 119R ($15.36), and some airtime, which is billed by the second. The airtime at its most expensive rate is 2.89R ($0.38) per minute, but since it is broken down by the second, so I guess I save a lot of money in unused airtime. Before I got my phone, a slick taxi driver tried to sell me his crappy phone for 500R at the entrance to the store, but when I realized that he wasn’t anyone associated with the cell phone store, I pushed passed him and saved nearly 400R and got a legitimate phone. 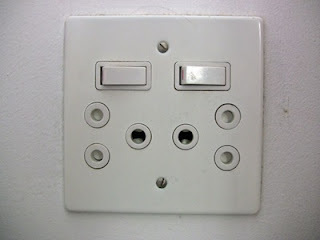 (This picture is for my youngest brother, Dylan, who really wanted to see what the plugs looked like in South Africa. The switches individually control the power going to that specific outlet). Next, I bought a plug adapter (South Africa’s plugs are unique to it alone), and it’s already lunchtime. I get a chicken sandwich from a place called Nando’s, which specializes in Portuguese and Mozambiquan (if that's a word) cuisine. The sandwich is fantastic, but they put a very spicy sauce (peri-peri sauce) on it that makes my nose run. Even in the airport, the price is reasonable (it only cost about $4 for a sandwich and fries). After lunch, I wander around the terminal, attempting to locate the FIFA shuttle that was supposed to be provided by the Organizing Committee. I wander around, but give up without success. Luckily, the backpacking hostel that I’m scheduled to stay at has its own free shuttle, so I call the place, and the proprietor comes personally to pick me up in a run-down pick-up truck. There’s an awkward moment where I attempt to enter the car on the right-hand-side, but I find a steering wheel instead. I’ve managed to forget that South Africa drives on the left, so the steering wheel is on the right. 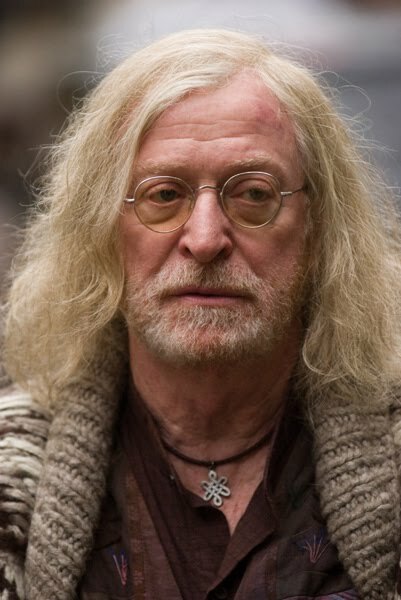 The guy who owns the place bears a strange resemblance to Michael Caine’s character in Children of Men, but without the beard, and his hair in a ponytail. He has a German accent, I think, but I could be wrong. We attempt to exit the mammoth parking structure, but the automated gates refuse to open after he inserts his ticket. He presses the “help” button on the gate, and the speaker on the gate has a recording: “Please be patient. Your call will be answered shortly.” The same phrase repeats over and over again for about three minutes. It stops, and nothing happens, so the guy presses it again, and the message plays again. And again. And again. After four attempts of pressing the button and about ten minutes of waiting, the gate finally rises, and the spike strip recedes. The guy explains to me that it was a lot faster and a lot easier when they had people doing the job of collecting money, but they automated the system a few months back, and it has been nothing but problems. 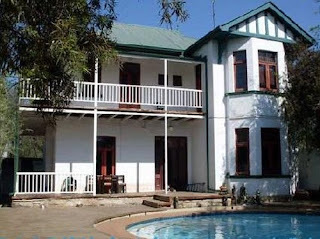 A fifteen-minute drive finds me at the backpacking hostel where I will spend a few days as I attempt to finish booking my accommodation for the duration of the tournament. The place is rather nice: there’s a circular swimming pool, a pseudo-tiki hut that serves as both a bar and a place to socialize, as it has a pool table, too. However, the place is clouded in smoke, as the guy who owns the place smokes constantly. I call the landlord to see when she would be available to meet, but get no response. I collapse on the bed, and fall asleep. I wake up, and it’s night already. I decide to explore the neighborhood a bit, but I learn that most things are closed. I walk across the street to a Portuguese restaurant (the only restaurant open for a few miles), and have a good dinner. However, I’m not sure they were entirely committed to the Portuguese theme, as the ambient music in the restaurant was “That Don’t Impress Me Much.” I disappointed myself further after I made the connection that the “ambient music” was just a Shania Twain album (“Man! I Feel Like a Woman!” was the giveaway). Attention world: I sincerely apologize that I know the names of two Shania Twain songs. I finish eating and pay the bill before heading back to the hostel and going to bed. I needed to be well rested for the day ahead…. zed - how you say the single letter "Z" in South Africa.